It will be an action packed year for the Catholic community in the state of Bihar as the Archdiocese of Patna rolls out a series of events and activities to mark its first 100 years. 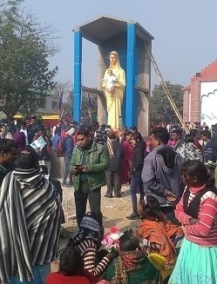 After a scintillating three day Bible ‘mega-fest’ in October last year, that followed the rather simple and low-key inauguration of the centenary year in parish churches throughout the archdiocese (prayer and 24 hour adoration of the Blessed Sacrament), November last year saw the official inauguration with none other than the Pope’s representative in India as chief celebrant of a brilliantly composed bi-lingual Mass. For Catholics, while the 100 years of the archdiocese is a reason to rejoice, it is also an occasion for introspection, and spiritual exercises, prayer and forgiveness. 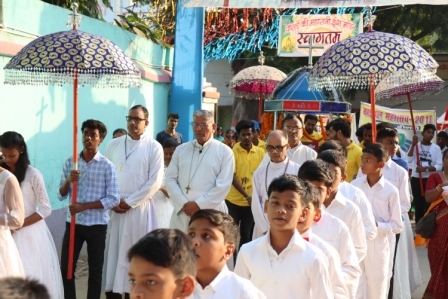 Harnaut, Barbigha, and Mokama are the focus parishes this week. From 22nd onward, three day deanery level retreats for the lay faithful will be under way. From 22nd to 24th March in Harnaut and Barbigha, and from the 25th at Mokama. Coadjutor Bishop Sebastian Kallupura will be present for the Mokama retreat. The retreat for the laity in Gaya parish will be held in the month of August. There are to be retreats for priests and religious, and several other prayerful events. 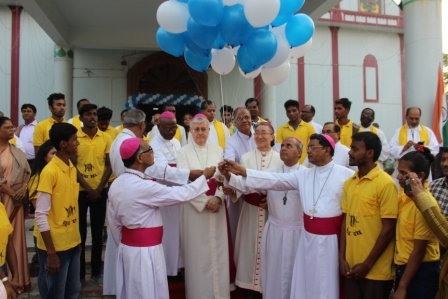 A day will be set apart (August 24) and all the religious in the diocese will be invited to Navjyoti Niketan, where the Presbyterium of Patna will thank, appreciate, and acknowledge the contribution of the religious for the growth of Patna Archdiocese. Catechists and Pastoral sisters will be treated to a 5 day long convention from 26th to 31st October at Navjyoti Niketan. The last day of the celebration will honour the senior and long serving Pastoral Sisters and catechists. Health workers, Catholic teachers, directors and principals will all have their special events and get-togethers. 100 deserving catholic Students are to receive scholarships, and about 100 BPL Catholics from different deaneries are to receive gifts of either a toilet or a hand-pump, according to information received from the office of the Vicar General, Rev Fr Prem Prakash. Director of Sewa Kendra Rev Amal Raj, and Director of Catholic Education Council Rev Joseph Raj will consult with the relevant Deaneries in this regard. As the year rolls on, ordinary Catholics have begun to enthusiastically contribute towards the celebrations. Families in rural areas are understood to be contributing Rs 100 towards their parish celebrations. In the cities, most catholic families will contribute according to their means and ability. School teachers and school principals of Catholic schools have also come forward with donations to support the expenses. It is learnt that most Catholic principals have donated a month’s salary towards the centenary fund.